Much has been written about the pros and cons of following traditions. Some see traditions as stifling growth and creativity. But traditions can also be seen as helping us to connect with the past and giving us guidance and comfort as we go forward. Here are some of the traditions that led us Seniors toward graduation in the 1950s. They are the same traditions, with only slight variations, that helped many others before and after our time to get through those final years of high school. 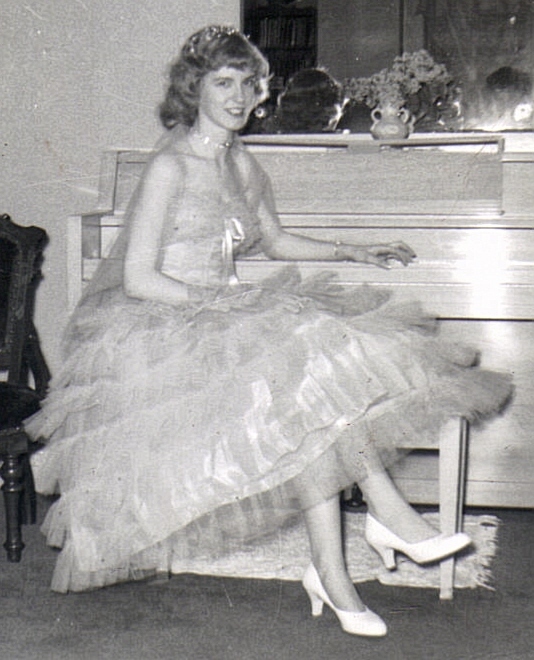 Ann Angel, dressed for the prom, 1958. The Class of 1958 was responsible for planning and setting up the Junior-Senior Prom that was held in 1957. The following year we attended the Spring Fantasy Dance designed by the then Junior Class. In 1957, the subject was “Calypso,” inspired by the popularity of Jamaican influence at the time in music and film. Remember Harry Belafonte’s “Banana Boat Song” or “Day-O”? After much hard work by most of our class members, the ordinarily mundane gymnasium interior magically became a tropical Caribbean island, complete with two young boys in island garb sitting in an open-sided straw hut. It was a dreamlike time for all — the guys in their rented white-coat tuxedos and the girls in floor-length or quarter-length gowns of several layers of pastel tulle — as we dined and danced to the music of Joe Cann and His Orchestra. 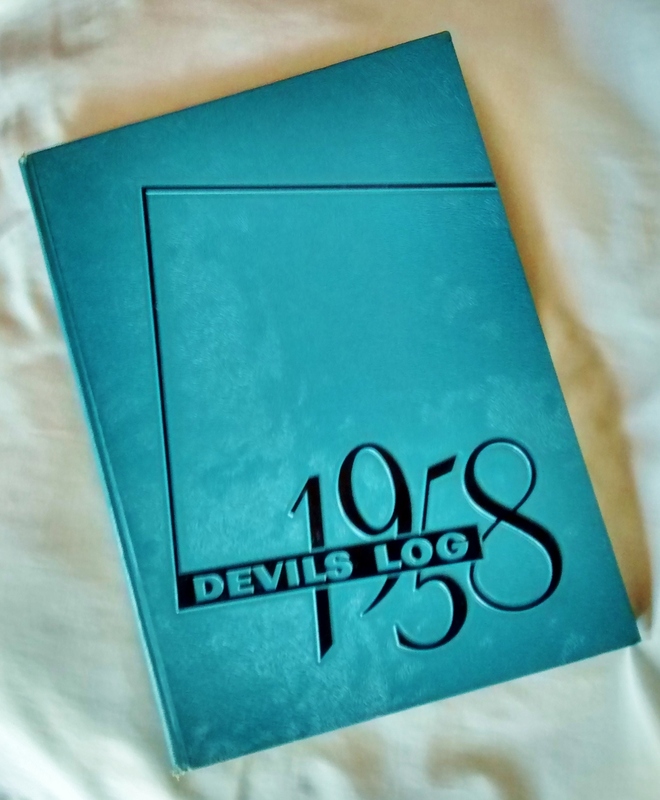 Sharpsville High School Yearbook, “Devil’s Log,” 1958. It’s surprising how longstanding some high school traditions can be! Leafing through my mother’s 1935 yearbook, my daughters’ from the 1980s, and my own in 1958, I’m reminded of the French saying, “the more things change, the more they stay the same.” These three generations of yearbooks recorded similar subjects: student photographs, of course, and those of students participating in sports, activities in the arts and many of the same types of clubs. And there were the handwritten autographs by fellow students in each book expressing the same kind wishes and remembrances: “Don’t forget all of our good times…,” “To a real swell friend and classmate…,” “Remember those trig classes and how we suffered,” “Wishing you the best in your future” and so forth. The class ring was a big deal in the 1950s, particularly if you had a sweetheart who would then wear it on a chain around the neck (or wrapped in tape to fit his or her finger) to signal that the two of you were “going steady.” I don’t think I ever actually wore my own ring, but it does show the wear and tear of having been in the possession of my then one-and-only. Seniors on Class Day gather outside of Sharpsville (PA) High School, 1958. Ann Angel, Sharpsville High School Class Day, 1958. Then it was October and time for the school homecoming game (alas, the Blue Devils lost to Meadville), followed by the homecoming dance. These activities were reigned over by the Pigskin Queen and her two attendants who were voted for by students from a group of six that had been pre-selected by the football squad. Along with attending proms, assembling yearbooks, and getting our class rings, the Sharpsville High School Class of 1958 continued to slog through the usual senior-year schoolwork, such as taking exams and writing our theses. Many of us attended a class trip to Washington, DC, others put on fundraising events to pay for these activities, and we all paid our various fees, ordered commencement invitations, acquired caps and gowns and practiced the graduation ceremony. And on the designated Class Day, we celebrated our achievements by acting as wild and carefree as we knew how, 1950s style. First, we dressed alike in the obligatory class outfit: blue and white striped sailor blouse and hat for girls and white pants or shorts. The boys dressed similarly, except for their striped shirts. Then, (I read this in the 1958 Devil’s Log yearbook but don’t recall it), we presented a Class Day Program for the Juniors that featured “dancing, singing and jokes.” And lastly, we noisily cruised Sharpsville streets in decorated cars for the rest of the day looking for something else to do. As I recall, I don’t think we were very successful in the latter activity. In any case, we tried hard to make it a day to remember and I guess, in that, we were successful. Despite the passage of time and changes in styles and technology, these high-school traditions live on. We’d love to read about your memories of this special time in our lives, when we were preparing to bravely leave our teen years behind and take on whatever adulthood would bring. –Ann Angel Eberhardt (SHS 1958), Goodyear, AZ. 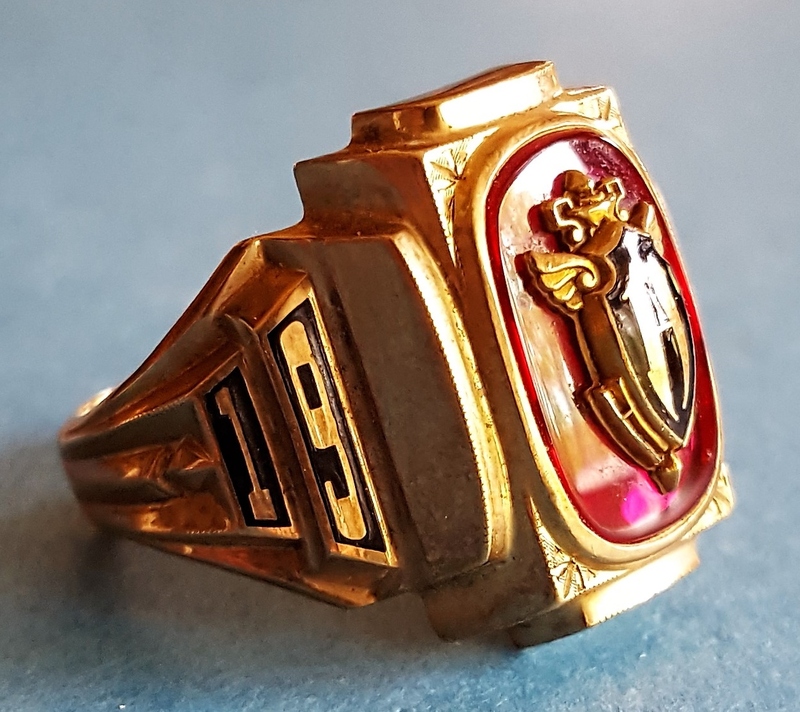 In the days of Angel’s Casino, someone in our family found a class ring while cleaning up the dance hall after a record hop. My father, originally intending to find the owner, put it in a box and apparently forgot about it. Recently, the ring was found again among his possessions by my brother, Mike Angel. It features the letter “H” (possibly Hickory High School?] on a red stone and the date 1962. Three-letter initials are engraved on the inside of the band. If you think it belongs to you or someone you know, please let us know in Comments. 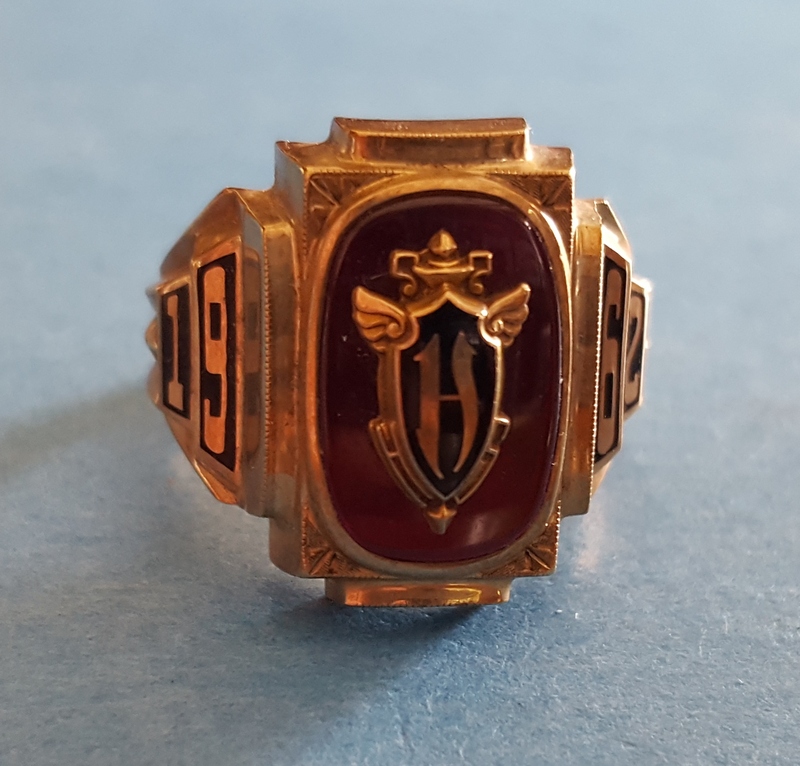 “H” Found Ring, 1962. Side view.